phog masheeen: Recording of Palm Springs performance, Video of My Funny Valentine! Recording of Palm Springs performance, Video of My Funny Valentine! Stimulating the Steel with Dry Ice. 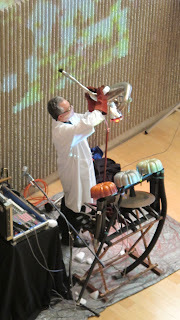 The Recording of the Palm Springs Museum of Art performance is available now at http://www.archive.org/details/PhogMasheeenPalmSpringsMuseumOfArt3-11-2012 The four story high atrium is an active participant in this performance. Enjoy! Thank you to Eric Strauss for the pictures! Thank you to Brother Andy and Shawn Savage for hosting the reception at the Savage Gallery. Thank you to Glen and the staff of the Palm Springs Museum of Art for making things so smooth! Palm Springs film maker Brother Andy has released a video of My Funny Valentine recorded at the Savage Gallery Reception! You can find it here: http://youtu.be/ODObjAh27uQ It is a spectacular work! Check it out now. Sawing on the pick heads with a threaded bolt. Ariel view of the application of Dry Ice. phog masheeen played on Le Vestibule radio show!